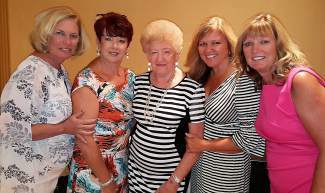 Lisa Abbott, Kathy Salizzoni, Shirley Abbott, Lisa Abbott Smoot and Lori Abbott Brown. • When life gives you lemons, you’ve got to make lemonade. • Be your own health advocate. Four months later, the lump hadn’t disappeared, so she visited an oncologist for a consultation. After two ultrasounds and a biopsy, the doctor told her it wasn’t anything to be concerned about, but just to be reassured, she had the lump removed. She had the audience at the Vail Breast Cancer Awareness Group’s annual Celebration of Life luncheon in the palm of her hand. A great storyteller with a vivacious personality, she told the story of her experience as a young woman with cancer, the support of her husband and the lessons she learned. Her experience through the journey of cancer prompted her to create a website, http://www.gottamakelemonade.com. Throughout the years, the annual luncheon has brought in cancer survivors Robin Roberts and Linda Ellerby and other speakers including Elizabeth Edwards, Dr. Nancy Snyderman and Dr. Susan Love. Around $1,000,000 has been raised to go to the women of the valley. No money is given to research; it stays with women who are battling cancer. Brenda Himmelfarb heads the organization and introduced Harris. Karen Wilhelm’s daughter, Gina Maltese, was diagnosed with breast cancer at the Sonnenalp Breast Cancer Center. She went through treatment at the Shaw Regional Cancer Center. The Vail Breast Cancer Awareness Group has been in the Vail Valley since 1994. The organization’s mission is to help ease the financial and emotional burdens endured by those women in Eagle County who are battling breast cancer. The money the group raises stays in the valley and helps women by providing “Shine on” bags, with $500 for each woman diagnosed through the Sonnenalp Breast Clinic and $50 for each child with a parent diagnosed. The money is to be used for whatever the patient desires. The group is also helping to purchase a state-of-the-art 3D mammogram machine for the Sonnenalp Breast Cancer Center and is sponsoring Hike, Wine and Dine for Jack’s Place on Sept. 18 at the $10,000 level. Tickets are $100 each and may be purchased by clicking on “Events” at http://www.shawcancercenter.com.